Jordan Beard (middle) pictured with the 2nd and 3rd placegetters of the Women's Racewear competition at Flemington. 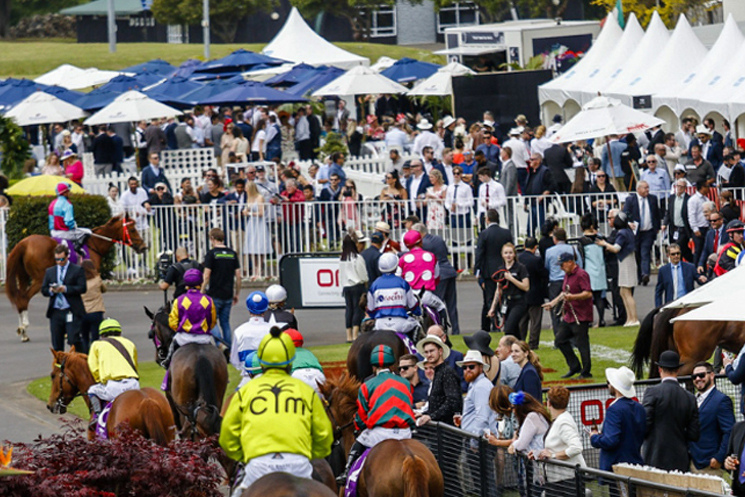 The weather didn’t play ball but that didn’t stop the 158th edition of the Melbourne Cup from being a huge success, with great racing on both sides of the ditch! Check out our summary of the day below. The ‘Blue Army’,Godolphin, got their first Melbourne Cup victory when the Charlie Appleby trained Cross Counter stormed down the outside to claim the race. This was the third time jockey Kerrin McEvoy has won the Cup, with him winning aboard Almandin in 2016 and New Zealand horse Brew in 2000. The exquisitely dressed Jordan Beard, a 26-year-old flight attendant from Cairns, won the Fashion in the Field competition for women’s racewear. Jordan wore a boater hat created by milliner Liana Hastie and a scarlet-coloured dress designed by Sonya Alba-Miller. A great turn out at Ellerslie Racecourse. Ellerslie delivered on their ‘part party, part raceday’ promise! It was a day of fine hospitality, great fashion and thrilling on-course action. The CVE, kept the party going well after the racing had ended, performing in the Cuvee lounge following the last race. On the racing front, Saint Emilion took out the feature race of the day, the OMF Stakes, in an impressive style with Stablemate Lizzie L’Amour finishing second. Opie Bosson had a great day, guiding home two winners. Contrary to Flemington, the sun was shining bright over Otago Racing Club for their Melbourne Cup meeting. The south certainly knows how to party, with students heading out to the track to celebrate the end of exams in style. Speaking of style, the Refind Rig fashion in the field competition was fiercely contested for, with Lisa Lamb coming away with the sash. ‘The race that stops two nations’ certainly didn’t disappoint this year and was a celebration of the racing industry. With the 158th edition of the Melbourne Cup now behind us, we eagerly look forward to the 159th!